A new undulating screen of recycled polyester seat belts engages traffic flows while providing new places for the experience of education and the arts. The screen itself has a dual purpose: The vertical straps produce a Moiré illusion by interacting with a silk-screened base layer. First, these Moiré patterns convey information at the same time they animate the space through their movement and distortion. Interference patterns between a revealing layer and a base layer result in an optical illusion of magnification and mirroring. These phenomena allow us to create a deep illusionistic space in the narrow cavity between the existing walls of the building and the installed screen.Secondly, the screen acts as a flexible infrastructure for hanging student, faculty, and community work. The polyester straps can be mounted onto or pulled aside to reveal display cases and video art. 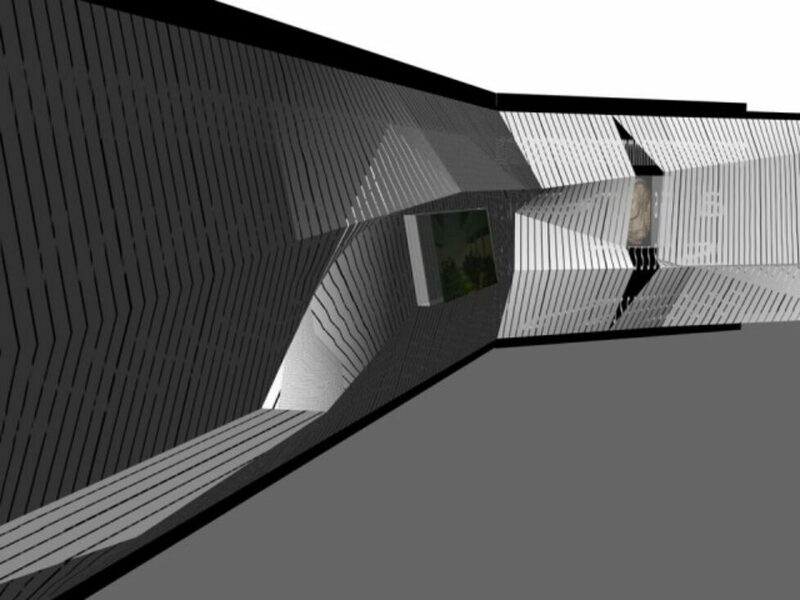 A moire pattern activates the space giving sense of depth. Through configuring each of the seat belt profiles to accommodate specific functions, the new screen fluidly engages a continuous range of activities from personal to communal scales. Polyester is the most widely used and produced polymer in the world making up around one half of all polymers produced. Its advantage, the durability of the material, is also its environmental disadvantage. In a landfill it will take most standard polyesters, such as those in seat belts, many thousands of years to biodegrade. 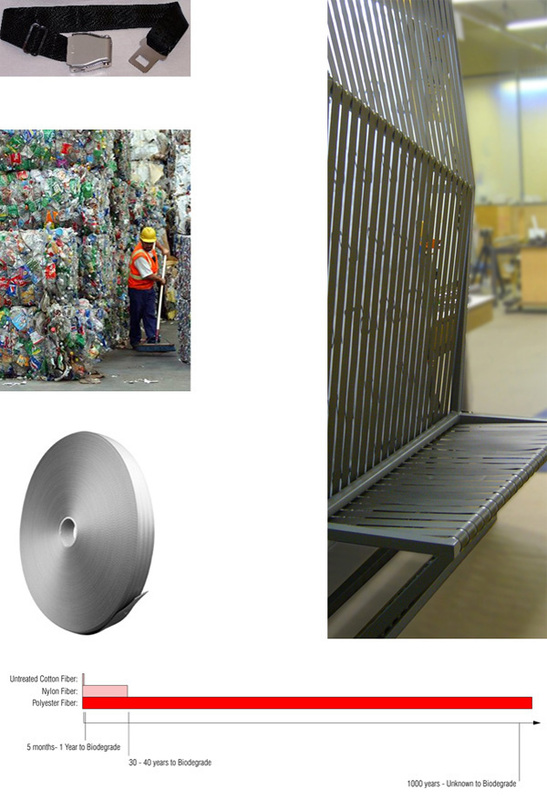 Although polyesters are in general highly recyclable, the process of doing so is energy intensive and releases new pollutants into the air and water. In light of this it is important to not only re-use existing polymer based products, but to raise consciousness about their life-cycles. 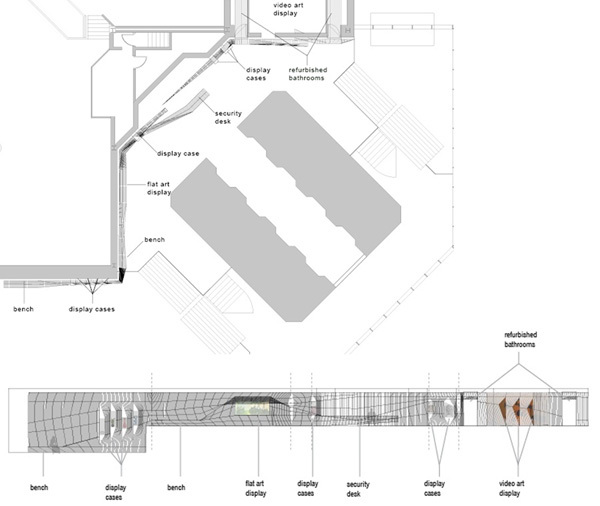 The existing lobby, originally seen as left over space, is transformed into a linear sequence of events (plan above, unfolded elevation below).